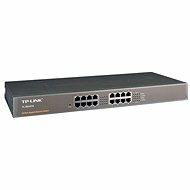 The TP-Link TL-SG1016D Desk Switch is an easy way to switch to a Gigabit Ethernet network. All 16 ports support the Auto MDI / MDIX feature, making sure you do not have to worry about the type of cable you need - just plug in and use it. In addition to innovative energy-saving technology, the TL-SG1016D can reduce energy consumption by up to 40%, making it an environmentally friendly solution for your corporate network. 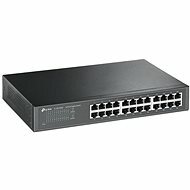 The TP-Link TL-SG1016D Desktop Switch is an easy way to switch to a Gigabit Ethernet network. All 16 ports support the Auto MDI/MDIX feature, ensuring you do not have to worry about the type of cable required - just plug it in and use it. In addition to innovative energy-saving technology, the TL-SG1016D can reduce energy consumption by up to 40%, making it an environmentally friendly solution for your corporate network. 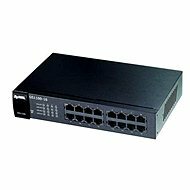 Automatic features ensure a plug-and-play installation of this gigabit switch. No configuration is required. Auto MDI/MDIX eliminates the need for crossed cables. The Auto Negotiation feature on each port captures the network connection speed (either 10, 100, or 1000Mbps) and intelligently adapts it to compatibility for optimal performance. 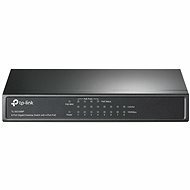 For shipping to other EU countries visit this page TP-LINK TL-SG1016D. 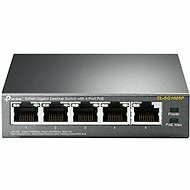 Für Versand nach Deutschland, besuchen Sie bitte TP-LINK TL-SG1016D. Chcete doručit zboží do Česka? 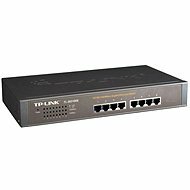 Prohlédněte si TP-LINK TL-SG1016D. Chcete doručiť tovar na Slovensko? Prezrite si TP-LINK TL-SG1016D. Für Versand nach Österreich, besuchen Sie bitte TP-LINK TL-SG1016D. Magyarországra történő kiszállításért tekintse meg ezt a termékoldalt: TP-LINK TL-SG1016D.